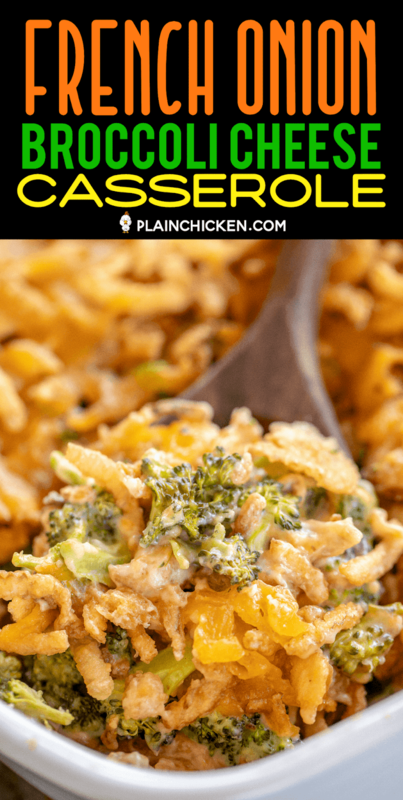 French Onion Broccoli Cheese Casserole - hands down the BEST broccoli casserole! 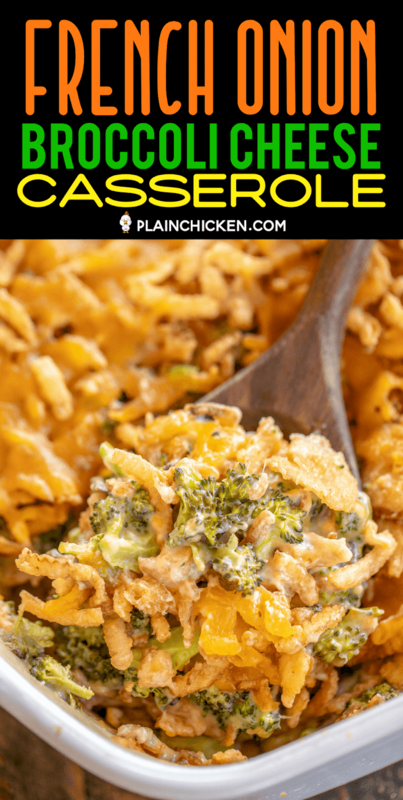 Even our broccoli haters loved this casserole. 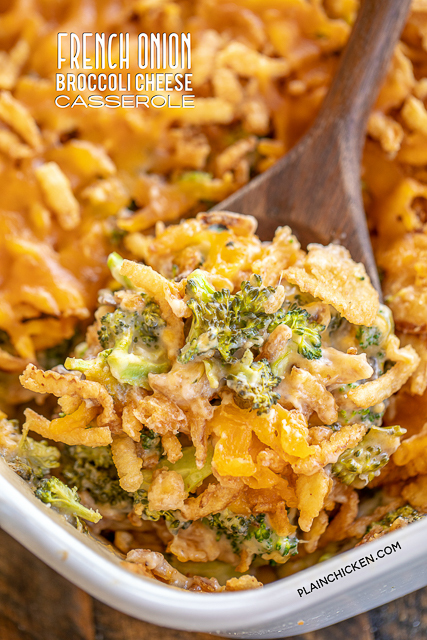 Only 5 ingredients - broccoli, cream of mushroom soup, french onion dip, cheddar cheese, and french fried onions. Can assemble ahead of time and refrigerate overnight. This was a HUGE hit in our house! 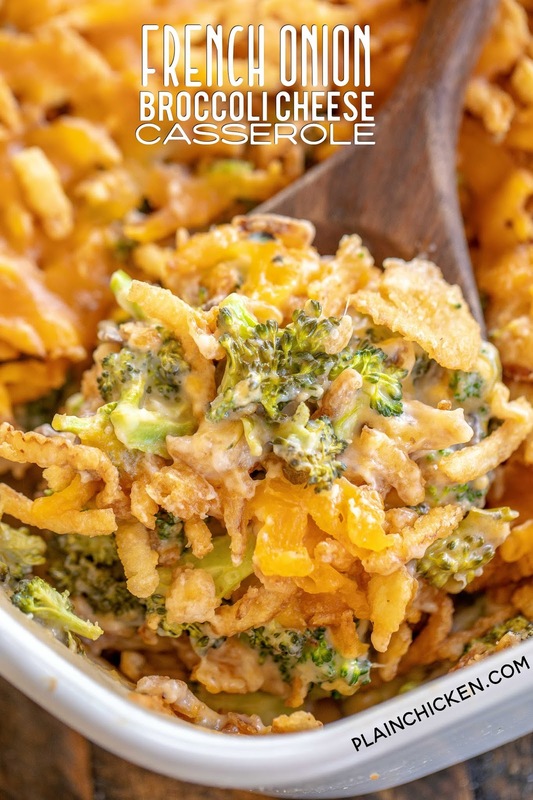 We are not big broccoli fans, but we both LOVED this French Onion Broccoli Cheese Casserole. 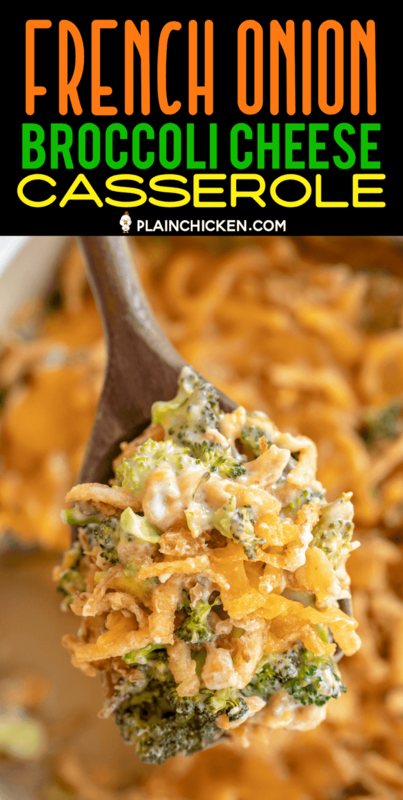 It is definitely our favorite broccoli casserole. With only 5 simple ingredients, this can’t be beaten!!! PLUS it is ready to eat in about 30 minutes. We love quick and easy side dish recipes like this. This is hands-down our favorite broccoli casserole. It is super delicious and SUPER easy to make with only 5 simple ingredients. Broccoli, cream of mushroom soup, french onion dip, cheddar cheese, and french fried onions. I used fresh broccoli florets, but you could also use frozen broccoli florets. To make this broccoli casserole, simply mix everything together and bake. It literally takes about 5 minutes to assemble. One very important note about this French Onion Broccoli Cheese Casserole. This recipe uses a cup of French onion dip. You want to use the sour cream based French onion dip found in the refrigerated section at the grocery store. I prefer the flavor of Kraft brand, but Heluva Good Dip or the store brand will work great too! Just make sure it is sour cream based and not the jarred stuff in the chip aisle. SO important!! Can I Make Broccoli Casserole in Advance and Freeze? Absolutely! You can assemble it ahead of time and refrigerate it until ready to eat. 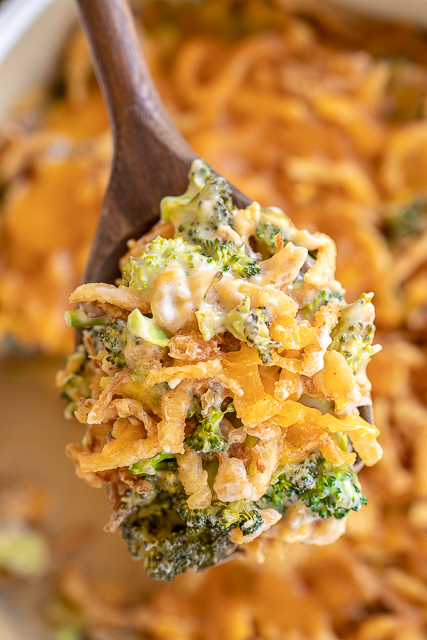 You can also make this French Onion Broccoli Cheese Casserole and freeze it for later. If baking from frozen, let the casserole thaw completely in the refrigerator and then bake as below. You can also freeze the leftovers for a quick side dish later. Just thaw and reheat in the microwave. It goes with just about anything - chicken, pork, steak, burgers. 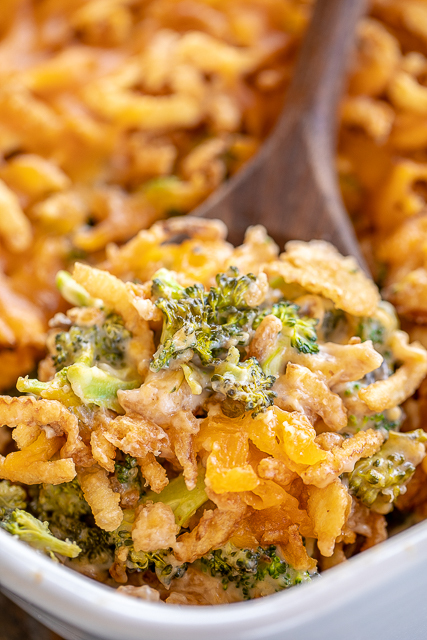 You name it, this French Onion Broccoli Cheese Casserole goes with it. Give this a try ASAP! I promise it will be a hit! Preheat oven to 350ºF. Lightly spray a 9x9-inch baking dish with cooking spray. Combine chopped broccoli, cream of mushroom soup, French onion dip, 1 cup shredded cheddar cheese and 1/2 of the French fried onions. Spread broccoli mixture into prepared pan. Bake for 25 minutes. Remove from oven, top with remaining cheese and onions. Bake an additional 5 minutes. Looks good! What do you think of adding rotisserie chicken? Can I use the dry onion dip like Liptons, and shor cream vs. 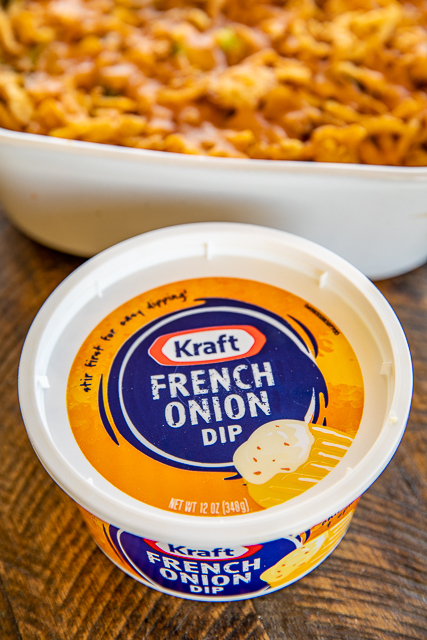 The French onion dip? Is this frozen Broccoli or fresh? Made this this weekend and it was wonderful, everyone loved it. Thanks for sharing!!!! !